Lynn Creighton’s sculpture belongs in museums, and since it comes with an urgent message it needs to be seen where it can have high visibility. Hers is a difficult art to bundle neatly and completely. Her female figures in clay and in bronze are more than the sum of their visible parts. That sum often totals “1”. 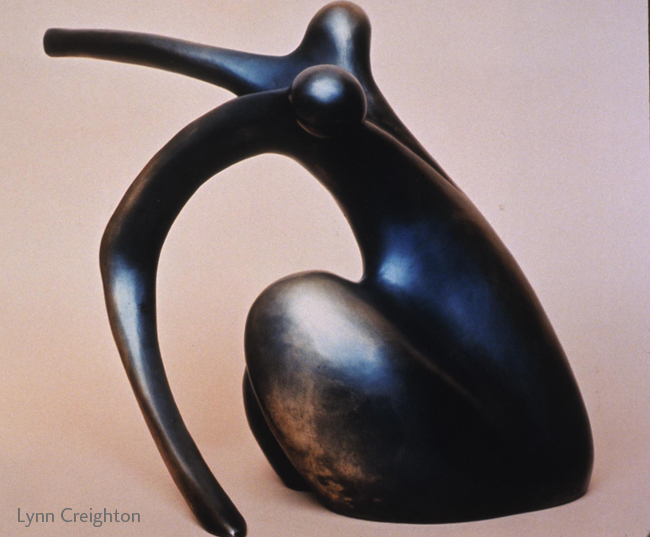 Creighton’s female figures are abstractions, or, more precisely and meaningfully, essentialities. In strictly art historical terms they are related to the pioneering visions of Henry Moore, Jean Arp or Constantin Brancusi. Like theirs, Creighton’s is modernist work in which only essence is left. The figures are seamless entities who comport themselves in a countless number of sleek configurations or poses. They are self-involved in the sense they declare that the individual self is the source of everything; consequently they are absolutely serene in whatever directions the clay takes them. They are talisman-like; and as such, they should ideally be appreciated as physical objects. The smaller ones should be held in one’s hand, letting their weight be experienced. They should be turned over in the palm so it can be understood that there is no bad or lesser side to a Creighton figure. It is right and composed from all aspects. Perhaps, in a museum context two or three could be set aside for holding. Their physical presence, one that cannot be understood by the eye alone, is one quality that sets Creighton’s sculpture outside the common run. 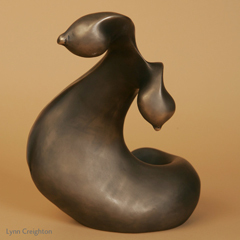 Another related singularity is Creighton’s strong personal bond with each piece. The sculptures are individuals and she gives them names: exotic ones like Desdemona or girl-next-door names like Jennifer and Janet. Creighton is a political artist, who has written a number of manifestoes from several creative angles. One is an imagining, like a Greek chorus, what her “girls” might say “finding the courage to speak and act through knowledge and embodiment of her own energy and beauty”. At the opposite end is a reasoned but daring look at Bill Clinton’s, and by extension mankind’s sexual woes. This ability to support a message is where Creighton’s pared-down artistic styles can really be appreciated. The pieces have to be spare and lean enough to take on the weight of meaning with which she charges them. Creighton talks of the bond with each figure being formed when she is rolling clay between her palms. This is her essence meeting the essence of the earth: a core which she knows is intrinsically female and which she knows she is getting in touch with and thereby quickening and resurrecting it. Artists often talk in rapturous terms about how the making of art brings about a self-transformation or at least fresh insights into life. Therefore Creighton’s descriptions of her contacting a feminine source within her work are not that unusual. And it shouldn’t be considered odd if she wants to get the passing art-viewer to slow down and really consider what she’s doing. What is really convincing, Creighton’s ace in the hole, is her having gone on vision-quests and her shamanistic training. She understands that art isn’t a static object but a vehicle that serves a high purpose. Many non-Western cultures have always understood this. She has glimpsed through hallowed means that the core of life, its heart and spirit as well as its root, is women’s special gift and responsibility. This idea expressed in various forms is permeating American culture more and more and its validity is not so readily dismissed out of hand. In these sculptures she has found a perfect, engaging vehicle for bringing essential truths to a wider audience. The confident figures help make a leap of faith. She doesn’t feed truth to people, rather, her gem like figures beckon her audiences to view life and their lives in a new, reanimated way. There must be an engagement between artist and viewer. Lynn Creighton does her part well. If such a shift in consciousness does occur, all humanity can appreciate, with the poet Archibald MacLeish, the basic but liberating fact that we are riders on the earth together.